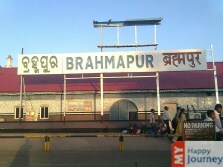 The name Berhampur was given by British colonialists, but it has been recently changed to Brahmapur, which reflects the influence of Sanskrit in the original name. This name when translated means “abode of Lord Brahma”. Once considered to be commercial center of kingdom Kalinga, Berhampur is famous among travelers as a popular pilgrimage center and religious tourism of the city contributes to its economy. Tropical climate is experienced in Berhampur as it faces mildly cold winters and hot summers. Being a famous destination for pilgrimage, devotees throng this city all through the year, irrespective of the weather. Large numbers of temples that are present in and around the city make Berhampur a true temple town. For the people who are spiritually inclined, the land of Berhampur offers plenty of places of interest. Various temples are present here, which are dedicated to different deities. Some of the famous temples in the region are Bagh Devi Temple, Biranchinarayan Temple, Durga Narayani temple and many more. A visit to these temples helps a person in relaxing. Also called as silk city, Berhampur is one of the oldest cities in Orissa. The sophisticated silk saris, also known as Berhampur patta, are one of a kind and truly unique. Also famous for its jewelry, many jewelry showrooms adorn the city markets. A not to miss attraction remains the hot water spring which is located near Taptapani. Tourism in Berhampur is versatile as it offers something for everyone. So plan a trip to this beautiful city which is full of temples, beaches and various other attractions and enjoy the famous tourist hotspots.